Ja Nan Lahtaw facilitates the highest levels of peace talks in Myanmar – but also the engagement at the community and grassroots level. Sustainable peace, she said, requires both. 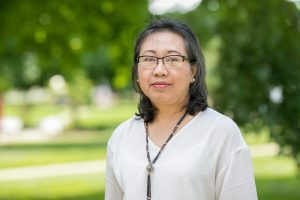 The technical adviser to the peace political dialogue process and consultant to the technical advisory team of the Kachin Independence Organization (KIO), Lahtaw earned a master’s degree in conflict transformation from Eastern Mennonite University in 2003. 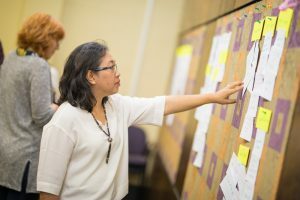 She returned this summer to its Summer Peacebuilding Institute (SPI) for a five-day course in process design led by Professor Catherine Barnes. In Myanmar, Lahtaw spends much of her time convening and facilitating negotiations between the Myanmar government and ethnic armed organizations as well as between various ethnic armed groups. Since gaining independence from Britain at the end of World War II, Myanmar has suffered from protracted civil war. Lahtaw is also the executive director of the Nyein (Shalom) Foundation, founded in 2000 by her late father The Rev. Dr. Saboi Jum and other leaders. Ja Nan Lahtaw is the technical adviser to the peace political dialogue process in Myanmar and consultant to the technical advisory team of the Kachin Independence Organization. Lahtaw’s two years of study at EMU’s Center for Justice and Peacebuilding (CJP) was facilitated by Carol Gowler MA ‘03 and David Tegenfeldt MA ‘04, who attended CJP at the same time. The couple, in Myanmar for the past 25 years with HOPE International Development Agency, have played vital roles in supporting justice and peacebuilding in the country. Gowler and Tegenfeldt have also facilitated and supported – including through sponsorship or the securing of funds – the studies of other peacebuilders at CJP: Kanyaw Paw MA ‘04, S’Lont Mun MA ‘05, Seng Pan MA ‘10, Mung San Maji MA ‘13 and Tu Hkawn MA ‘14, who is an associate dean at Kachin Theological College and Seminary and an active peacebuilder. They sponsored Shalom’s associate director Nang Raw to attend SPI. Shalom’s office manager Zau Ma Lahtaw has also attended SPI, and another CJP graduate, Joanne Lauterjung MA ‘14, plays an ongoing in-country role in peacebuilding and inter-religious dialogue processes. Those CJP connections have resulted in ongoing faculty involvement and visits to the country by Jayne Docherty, Barnes, Ron Kraybill, John Paul Lederach and David Brubaker, whose input through workshops or long-term facilitation has influenced those serving in leadership roles in the country’s peace process. 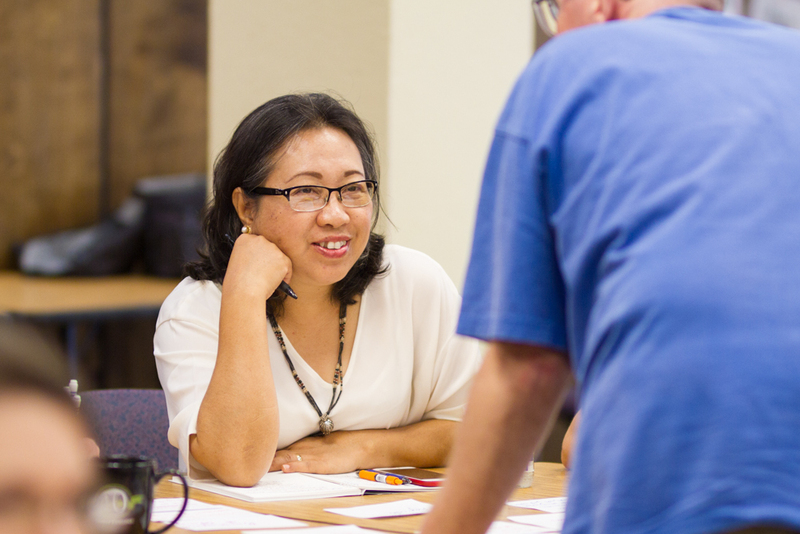 Lahtaw said that her graduate studies led to a redesign of Shalom’s program and shaped its peacebuilding strategy. “Learning from here is totally reflected in what we do,” Lahtaw said. The ongoing efficacy of Shalom is built on a foundation established by Lahtaw’s father. Since the early 1980s, Saboi Jum was a local mediator between the government and the KIO; he facilitated a 1994 ceasefire agreement that would last for 17 years. Through that work and as director of Shalom until 2014, Saboi Jum earned the trust of the government and military as well as ethnic armed organizations, trust that Lahtaw has maintained and deepened through – for example – Shalom’s transparency in managing international funds donated to support capacity building, meetings and workshops for armed organizations as they prepare for peace negotiations. Under Ja Nan Lahtaw’s leadership and with partners, the Nyein (Shalom) Foundation is empowering and nurturing youth to become community leaders, has a trauma healing program, facilitated the forming of the Alliance for Gender Inclusion in the Peace Process, and in 2012 created the Civil Society Forum for Peace. With partners, Shalom is empowering and nurturing youth to become community leaders, has a trauma healing program, facilitated the forming of the Alliance for Gender Inclusion in the Peace Process, and in 2012 created the Civil Society Forum for Peace. In July, that forum convened for the 19th time to hear the concerns of community stakeholders – often about “ongoing clashes on the ground” including military offensives that take place in spite of the current ceasefire, Lahtaw said – which are then taken to decision makers. Lahtaw’s passion for her work comes from seeing the suffering and despair of people affected by Myanmar’s ongoing conflicts. When she becomes frustrated by formal negotiations, she finds hope in grassroots efforts. “You see more options – you see more energy – at that level,” she said.